Iran's supreme leader controls a business empire worth around $95 billion, exposes Reuters. While Iran has been buckling under the sanctions that have been crippling its economy, the country’s supreme leader is apparently enjoying the billions he has in the bank. The Reuters news agency exposed on Monday that supreme leader Ayatollah Ali Khamenei controls a business empire worth around $95 billion, a sum exceeding the value of his nation’s current annual petroleum exports. The little-known organization, called Setad, is one of the keys to the Iranian leader’s enduring power and now holds stakes in nearly every sector of Iranian industry, according to Reuters. These include the finance, oil, telecommunications, and even ostrich farming sectors, among others. The company has essentially built its empire on the systematic seizure of thousands of properties belonging to ordinary Iranians, including members of religious minorities, Shiite Muslims, business people and Iranians living abroad, according to the report. According to the news agency’s investigation, Setad has amassed a giant portfolio of real estate by claiming in Iranian courts, sometimes falsely, that the properties are abandoned. The organization now holds a court-ordered monopoly on taking property in the name of the supreme leader, and regularly sells the seized properties at auction or seeks to extract payments from the original owners. The organization’s full name in Persian is “Setad Ejraiye Farmane Hazrate Emam”, translated as Headquarters for Executing the Order of the Imam. The name refers to an edict signed by the Islamic Republic’s first leader, Ayatollah Ruhollah Khomeini, shortly before his death in 1989. His order spawned an entity intended to manage and sell properties abandoned in the chaotic years after the 1979 Islamic Revolution. Since that time, Reuters discovered, Setad has morphed into a business juggernaut with real estate, corporate stakes and other assets. While Setad controls a charitable foundation, it’s not clear how much money goes to charity. Setad’s director general of public relations, Hamid Vaezi, told Reuters by email in that the information presented is “far from realities and is not correct,” but would not go into specifics. The news agency has estimated Setad’s total worth at around $95 billion, made up of about $52 billion in real estate and $43 billion in corporate holdings. Over the past few years, Iran has been slapped by the West by several rounds of sanctions over its nuclear program. The sanctions have been blamed for slashing Iran’s oil exports and undermining the value of the rial. The value of the rial has fallen by more than half since the beginning of last year as Iran. Several months ago the Iranian currency plummeted to an all-time low. 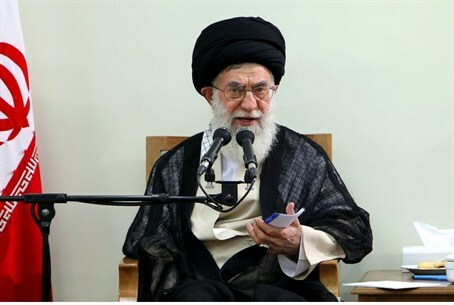 Khamenei has also been critical of Western states negotiating with his country over its nuclear program. He has warned that Washington was "not trustworthy", after former U.S. officials and lawmakers urged diplomacy with President Hassan Rouhani. Israel has pointed out that no matter what moderate statements Rouhani makes, it is Khamenei who makes the final decision on Iran’s nuclear program.